The new Graph It Alcohol Marker range will be featured on Create & Craft tonight at 6pm. The talented Nikky Hall of Polkadoodles will be showing you this fabulous new range. 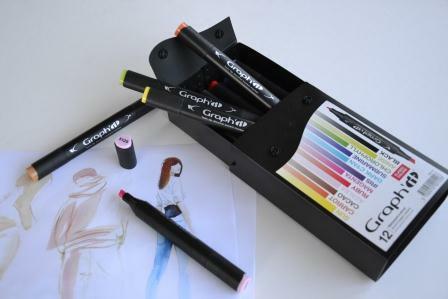 There will be 11 different sets of 6 markers, each with a blender pen and stylish Roll & Go wallet to store your markers. The 2013 Trend colours set will also be featured. In developing this set, Graph It employed the skills of Carlin International the leading trend forecasting agency. So if you want to be "on trend" with your marker colours this is the set for you. Nikky will also be showing you how to use the Mix It palette. Mix It is a unique surface on which you can blend colours to create your very own new colour. When the colour dries on the palette you can return days, weeks or even months later and use it again simply by lifting the colour off the palette with your blnder pen.